Attorney Andrew Cohen analyzes legal issues for CBSNews.com. The battlefield was the same, and in at least one important way the battle was, too. In Montgomery Alabama, where Rosa Parks in 1955 famously refused to give up her seat on a bus to white passengers, State Supreme Court Justice Roy Moore this week famously refused to give up his 2.6-ton monument to God. In Montgomery, where the Freedom Riders came in 1961 to press their case for civil rights, devout citizens came this week to press their case for the presence of the Ten Commandments in public places. In Montgomery, where federal judges and state officials clashed for nearly a decade a generation ago, the clash of jurisdictions and sovereignty this week flared anew. If you closed your eyes and just listened to the angry rhetoric coming out of the Alabama capital this week, you might have thought you'd open your eyes again to black-and-white television, an Eisenhower or Kennedy administration, and leaders like Ross Barnett and George Wallace. But this is 2003, not 1963, and the issue that apparently divides people to the point of shouting these days is not racial equality but religious freedom. Can you imagine people fighting so intensely over whether a stone tablet ought to rest in one spot or another? What would Moses say? How about Aaron? As a purely legal matter, the Ten Commandments controversy that reached its nadir this week is not nearly as complicated as some suggest. The law is fairly clear: religious symbols or monuments in public places must have some "secular purpose" in order to pass muster under the first amendment's Establishment Clause. What is even more clear, indeed, what is incontrovertible, is that federal courts and not state court officials have the final say about what the Constitution means and does not mean. Legally-speaking, then, Judge Moore pushed a loser case on the merits and then compounded his error by blatantly disregarding an upheld-on-appeal federal court order that said so; a double-header loss for a jurist if there ever was one. The "secular purpose" standard would have been satisfied if, say, the Ten Commandments were placed alongside the Magna Carta and the Code of Hammurabi as sources of American law. There are many public places around the country-including the Supreme Court building itself in Washington - which have these sorts of displays that have religious as well as educational purposes. To the extent that anyone complains about these sorts of displays, the complaints go nowhere in court because judges all over the country have agreed that there can be some religion in public life. Notably, Judge Moore was given the option earlier in his case of including educational or secular components into his monument display in order for it to be permitted at the court building. When he refused to do so, his cause was doomed as a matter of law. 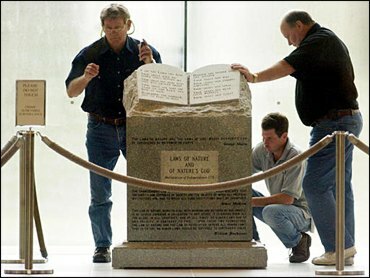 Moore's actions (or inaction) convinced the federal courts that his motivation in putting the Commandments on display in the public rotunda of a state building was precisely the sort of content-driven conduct that the first amendment prohibits- the official state-sanctioning of a particular religious belief. Why else would the judge prohibit other, legitimate sources of American law? And why in the world would anyone think, after the judge's public comments these past few months, that his intent in bringing the monument was anything other than the promotion of a Judeo-Christian belief? Judge Moore's devotion to his own cause did him in; his very stridency proved to a gaggle of smart judges, including some very conservative ones, that the Establishment Clause would be violated if the monument were to stay public. On its facts, Judge Moore's cause isn't easy to compare with the civil rights cause that brought Montgomery into the focus of the law a generation ago. But there is an echo that resonates from 1955 to today. It is the echo that results from the thunderclap that comes when federal judges clash with state officials-or, more precisely, when state officials defy the federal courts. Part of the history of the civil rights movement in America in the 20th Century is a history of federal judges bravely ensuring enforcement of the law at great risk to their personal safety and standing in the community. Part of the history of the Ten Commandments saga is the history of the federal judges, including many on the conservative 11th U.S. Circuit Court of Appeals, flexing their muscle at great personal risk and professional scorn to rein in Judge Moore and his supporters in state government in Alabama. This is not just a sidebar to the political and religious component to this story. To me, it is the most important theme. Spitting matches like the fight over the Ten Commandments come and go. But the federal courts are forever. Federal judges, often alone, stand between order and lawlessness; between the rule of law and mob rule. They are, as the Constitution's drafters intended them to be, the minority's bulwark against the tyranny of the majority. To me, then, the story of "Roy's Rock" isn't just a story about some people wanting more religion in public life. To me, the story of Alabama's Ten Commandments is a story about how vital it is to respect the federal courts when they speak - whether you like what they say or not - and how futile it is not to. It's a lesson a state judge like Roy Moore should have learned long ago.